Honestly, whenever we talk about tourism, the first (and only for some) place that comes to mind is Cox's Bazaar. As sad as it is, our governments' lack of effort in advancing the tourism industry has resulted in ignoring many of our magnificent relics; but that's another topic. No matter what, Cox's Bazaar is definitely and arguably the most prominent tourist spot, which with some major voting might end up being one of the new 7 natural wonders. With the rainy season pouring in (like piercing needles at times), most people consider now to be the off-season, some in fear of signals and rough waves (which is legitimate)and some in fear of getting wet in the rain (which is completely absurd). Anyhow, with comparatively less people cramming the beach right now especially in weekdays, if you ask me, now is the high time to take a trip (and lots of dips) giving you the feeling of Cox's Bazaar being your very own private beach. With hotel pricings being negotiable with discounts and also darn low, you can get decent non AC rooms for as low as Tk.300 and AC ones for a little over Tk.600. Then again, there are of course the posh expensive ones. As most of you know (I hope), in Cox's Bazaar the beach is not the only attraction. While you can bathe in the sandy salty waters, you can also visit pagodas, drink the crystal cool waters of Himchori (only 8 km from the beach), or take trips to several islands; Moheskhali being one of them. But before talking about this island of temples, I wanted to emphasize a little on who this “Cox” guy is. This region used to be the favorite of the Mogh pirates and brigands who along with the Portuguese merchants used to ravage the Bay of Bengal in the 17th century. While the Portuguese didn't settle down, the Moghs did, maintaining or rather preserving parts of their tribal ways through handicrafts, hand woven fabrics and other cottage industries. When the British took over the area in 1760, Captain Hiram Cox founded the town as a refuge for Arakanese fugitives who were fleeing their land after being conquered by the Burmese. I have no idea how the “Bazaar” part got added but yeah, that's how the name Cox's Bazaar was settled. So whenever we refer to Burmese people settled there, we are actually referring to a mixture of Arakanese (now called Rakhine) people from Burma and Moghs, among others. 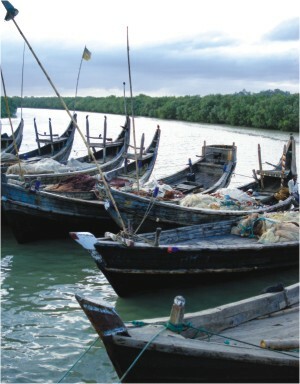 Getting to Moheskhali Island from Cox's Bazaar can be quite the excitement congested trip. Only a 13 km river route, the ride can take over half an hour (with a troller) or less than 15 minutes (with a speedboat). Ask any rickshaw walla to take you to 6 Number Fishery Ghat which shouldn't cost you more than 25-30 bucks from the main Cox's beach. Trollers make round trips almost every hour, costing only 15 bucks whereas speed boats head out to the island whenever 10 people get together, costing Tk.80 per person. Of course you can also reserve a speed boat for Tk.1,000 but I see no reason in doing that unless you are like 10 people together. Either way, ensure that the sky is pretty clear and that a storm is not on its way; if one is and you are already on a boat, start praying. Anyhow, if you take the speed boat enjoy the bumpy river road with the gushing wind and hopefully some adrenaline pumping in at the same time, and if you have the tendency of nausea, try not to vomit; Poseidon probably won't like it. You will arrive at Ghora Ghat on the southern tip of this 362 sq. km island. If you are observant you'll immediately be able to trace the almost lost old simple rural lifestyle of Bangladesh. It's hard to describe in words, but the place gives you a feel of worry-free days enwrapped with the good and bad of nature. Anyhow, rickshaws are readily available, and a trip to the Buddhist Monastery and Adinath Temple and back should not cost you more than Tk.60; if they want more, they are probably ripping you off. According to a report of a Portuguese traveler Caesar Frederick, Moheskhali was separated from mainland due to a severe cyclone and tidal wave in 1559, thus giving it its birth. With a population of nearly 14,000 people, the island houses all Muslim, Hindu and Buddhist religions pretty peacefully for several years. Furthermore, being a prime exporter of prawns and shutki, Moheskhali is renowned for its assortment of Betel or supari trees scattered all over the place, which is also a major export item. While several items of interest exist in the island, the most prominent are the Buddhist Monastery and the Adinath Temple. The Buddhist Monastery is just a 10 min rickshaw ride into the island housing several Buddha statues for worship. The design and architectures of the place clearly stands out and you will find many children running around the place being taught and brought up within the monastery. Sadly, little is known about the Monastery's origin although the monks there claim it to be over 300 years old. The Adinath temple located in Moinot Porvot and dedicated to Shiva, according to locals, was apparently built by a Mughal in mid 1650s after a very benevolent man named Adina (and hence the name). While you do have to climb a set of stairs similar to that in Himchori to get to the temple, the view from up there is exotic! Not only can you see the entire Moheskhali, but also the nearby Sonadia Island while you get a taste of the slightly salty breeze of the sea. Religious festivals also take place around the year in the island, with inflow from Burma, India and even Nepal, the biggest of which take place after the 14th of Falgun which is around the end of April or beginning of May. If you can plan a trip during that time, you'll definitely be in for one heck of a time! Getting around the entire Moheskhali doesn't take much time frankly. A one day trip should be more than enough; and if you think you can cover more, head over to Sonadia Island which is pretty close from Moheskhali. Take your time though and enjoy the scenery; it'll definitely revitalize you. Till next time, adieu!